Homemade black pepper focaccia and some of the last garden fresh cherry tomatoes lightly brushed with Chardonnay Moroccan Grapeseed Oil and broiled to slightly charred and juicy perfection, served with lush avocado, a crispy egg, and a generous drizzle of Date Balsam Creme Vinegar. Inevitably one must get back to living. To that end I got away last weekend, in a real world sort of way, out-of-town and on the town. As a reward for weeks of deathbed vigils I registered for the IFBC15 (that’s the International Food Bloggers Conference for my three readers who aren’t fellow food bloggers) in Seattle. While my reason made the “Why did you come to this conference?” part of every conversation a little awkward the conference was better than I expected and not just because they ply you with food and drink and gift bags plump with gadgets and samples but because I spent the weekend with hundreds of people who share my love of food and drink and writing and photography. Amongst all the swag, and there was some swag, were two tiny bottles of oil and vinegar from Oil & Vinegar, tiny and demure on the outside, full of surprise and spice and sweet on the inside. 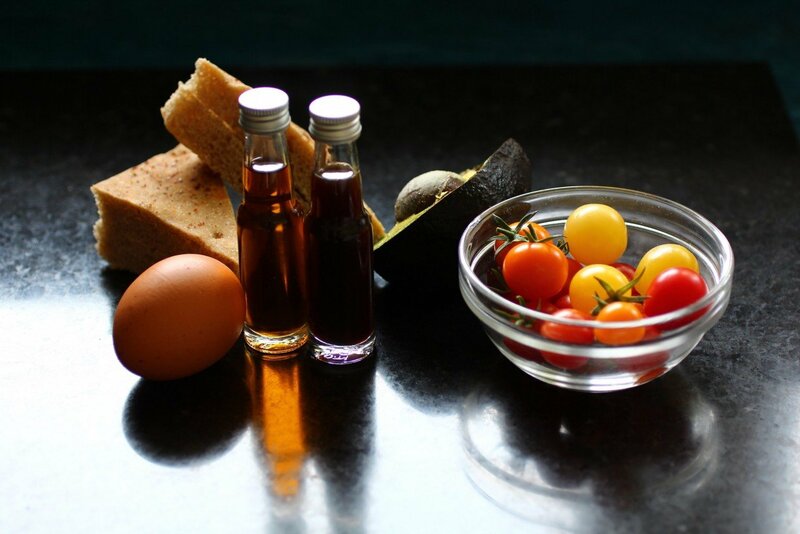 The grapeseed oil, infused with eight herbs and spices, had a nice kick perfect to drizzle on sweet cherry tomatoes or brush the bread with for an added level of zing. The sweetness of the vinegar would go perfectly with an arugula salad or even in a fizzy cocktail but I went the other way with buttery avocado and egg. What a combination of contrasts and complements. As easy as any dish with toast in the title should be, I used one cutting board and two cast iron skillets- one for the eggs and one for the toast and tomatoes. Broil the toast and tomatoes until the toast is just browned, lightly salt if desired and remove the toast from the broiler. 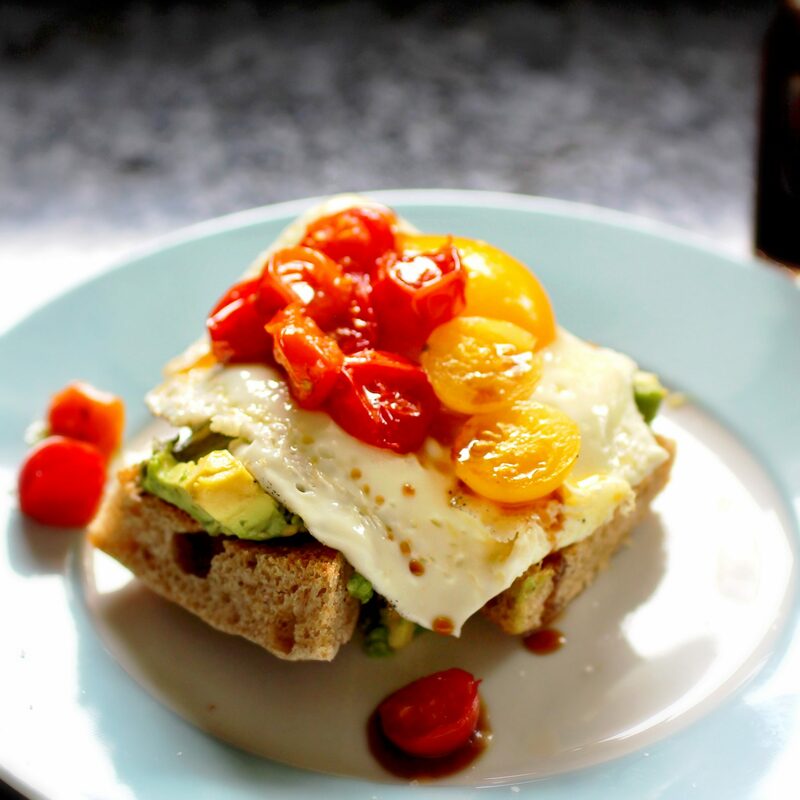 Continue to broil the tomatoes while you cook the eggs and slather the toast with avocado. 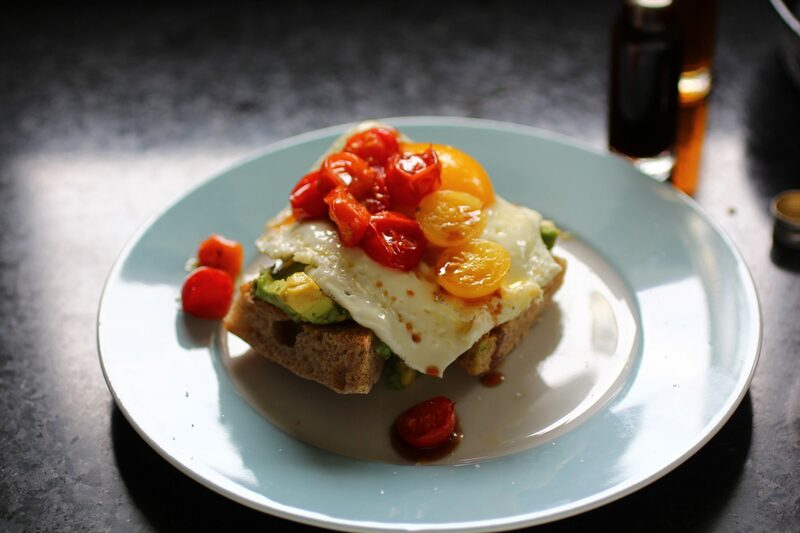 Top each toast with an egg and half of the broiled tomatoes then drizzle each with the date vinegar and serve.